The Sulphur mineral is an amazing mineral that has a historical reputation for curing many ailments and alleviating the symptoms of many conditions. In third place behind calcium and phosphorus, Sulfur is the most abundant mineral in the human body. Every single living cell inside the body contains an element of Sulphur and it is also a component of amino acids which are seen as the building blocks of the body. Sulphur has a reputation as being the body's beautifying mineral. If you have ever immersed yourself in a Sulphur spring, you know that this statement is true. Another reason for this claim to fame probably has to do with the fact that Sulphur is in keratin which keeps hair, fingernails and skin strong and healthy. Sulphur also plays a significant role in the production of collagen, skin's best ally. Collagen is actually present in the skin's connective tissues and these tissues help maintain the skin's elasticity. Collagen also helps wounds heal better and faster. Sulphur is also involved in cellular respiration, which in simple terms means it helps the cells use oxygen efficiently. The end results of this bodily function are improved cell activity and brain function. Sulphur helps the body rid itself of toxins which is why it's known as a detoxifier. That's important because over time, toxins can build up inside the body and cause the immune system to weaken, or create an overall feeling of lethargy or even impair the body's own built-in cleansing system, the kidneys and liver. When the body is detoxified, it feels rejuvenated. Sulphur has many anti aging properties and it helps relieve the symptoms associated with age related conditions such as arthritis. Sulphur has been used to relieve the symptoms of skin conditions such as eczema, psoriasis, diaper rash, hemorrhoids, dry scalp and acne. In fact, countless ointments, creams, lotions and other types of skin care products contain Sulphur. Sulphur also plays a very key role in the metabolism of several important B-vitamins including B-1, B-5 and Biotin. Sulphur is found in all proteins so eating a protein rich diet is one of the best ways to ensure the body gets an ample amount. Some of the best sources of Sulphur include lean meats, poultry, fish, eggs and egg yolks, milk and legumes. Garlic, cabbage, brussels sprouts, onions, turnips, kale, lettuce, kelp, seaweed and some nuts also contain Sulphur. Individuals following vegetarian or low-protein diets must be sure to supplement their intakes of protein. The general consensus on Sulphur is that most people get all they need from simply eating proteins. Therefore, there are no recommended daily allowance guidelines for this mineral. Considering all the benefits derived from Sulphur, it makes sense to make sure protein is part of every diet, regardless of age. Since most people get sufficient quantities of Sulphur from their diets, instances of Sulphur deficiency are extremely rare. 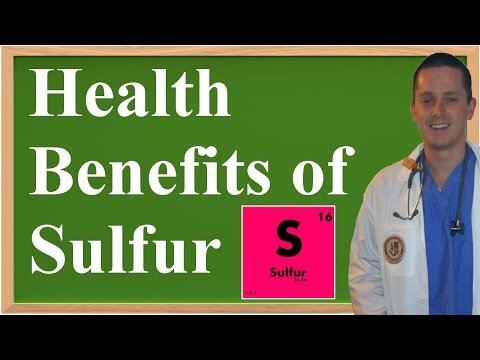 Symptoms of Sulphur Deficiency may include skin problems or disorders, muscle pain, nerve disorders, circulatory trouble, arthritis, inflammation, damages resulting from free radicals, stress, infection, constipation and wrinkles.